How can someone, especially someone who purports to be interested in healthy eating and vegetables, reach the ripe old age of 40-something and still never have tasted a turnip? Shocking, I know; but yes, indeed, that someone is moi. I blame it all on Modern American Drama. One of the first courses I took as a university student, it was taught by my mentor, John Ditsky , for whom I harbored a 20 year-long crush (but that’s neither here nor there). Soooooo. . . . back to the turnips. When our organic produce box arrived this past week and I spied a kilo bag of turnips, I was thrown into a panic. What to do, what to do? Would there be a way out of this mess? (“Yes, you had us rather worried for a bit, Mum. And why do you keep talking like that? Who is this Godot person, anyway?”). Well, I decided it was time to Confront the Turnip. Like it or not, I was going to cook with these babies! In order to survive the ordeal, I decided to start small, something easy and relatively foolproof. Soup! One of our favorites here in the DDD household is a fabulous Parsnip and Pear soup from Flip Shelton’s Aussie cookbook, Green (and since turnips are the illegitimate offshoots of parsnips, it gave me an idea . . . ). I had been both surprised and delighted by the fabulous melange of smooth, sweet, spicy, and savory in that soup. Shelton’s recipe was extremely simple, yet the final result exalted the lowly roots and fruit to a level beyond the sum of their parts. I thought, what about a similar recipe for turnips with pears? As usual, we had a bunch of overripe pears in the house, so there was no problem finding the fundamental ingredients. And it also occurred to me that this would be a very suitable entry to Sweetnicks‘ weekly ARF/5-A-Day roundup, so it will also be my contribution to that event this week. 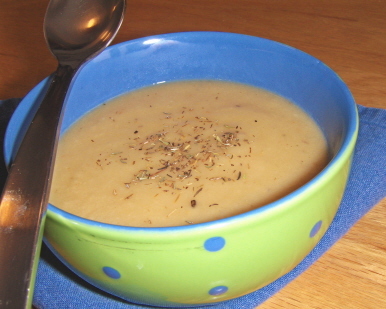 After a bit of digging around for some kind of turnip and pear soup recipe, I found something that sounded appealing in my old Sundays at Moosewood cookbook, called, oddly enough, Turnip and Pear Soup. The challenge began! The soup was ridiculously easy to prepare, and took only about 30 minutes from start to finish (including peeling and chopping). It was warming and really quite tasty. While I know that turnips are not to everyone’s taste, if you’re feeling adventurous (or existential–I mean, who knows when we’ll next have the chance to taste a turnip? ), then go ahead and give this one a try. And, well, if it turns out you don’t like it, I suppose you could always serve it to Pozzo and Lucky. They’ll eat anything. I never ate turnips growing up. I love them now. But they do, in my mind, require either running with the savory flavor and adding to it with great herb or mixing them up with a great contrast, like your pears, to cut down on the very . . . turnip-ness of them. I think you must be right about this one. . . the pears really did “hide” the turnip-ness, and I hardly tasted them at all! (Probably why I liked this. . . ). I’ve never used turnips in soup before. This sounds delicious! I do like turnips, though. I sometimes eat them raw, but my favorite way is to roast them with other vegetables like potatoes and carrots. Thanks for the soup idea!